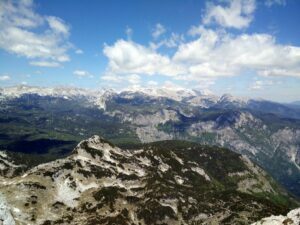 After climbing the 2236 meters high Stol peak on the border between Austria and Slovenia, I decided to continue my “Hiking the Alps” tour by ascending the 2054 meters high mountain Vrh nad Skrbino in the southern Julian Alps. Vrh nad Skrbino is a quite popular mountain because it offers a great view on the higher peaks of the Julian Alps (also on the 2864 meters high Triglav mountain) while the numerous trails leading to the top are not particularly demanding. In order to avoid snow on the trail I decided to ascend the mountain from Planina Kuk (a mountain pasture) which is located south of the mountain. 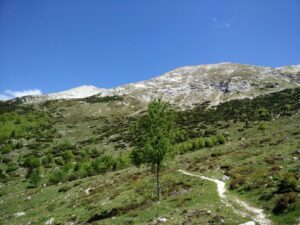 The trails leading to the peak over its northern slopes were still covered with snow in May when I was doing the hike and would have required additional equipment – gaiters and probably also crampons and ice axes. Expect such conditions in winter, early spring and late autumn. 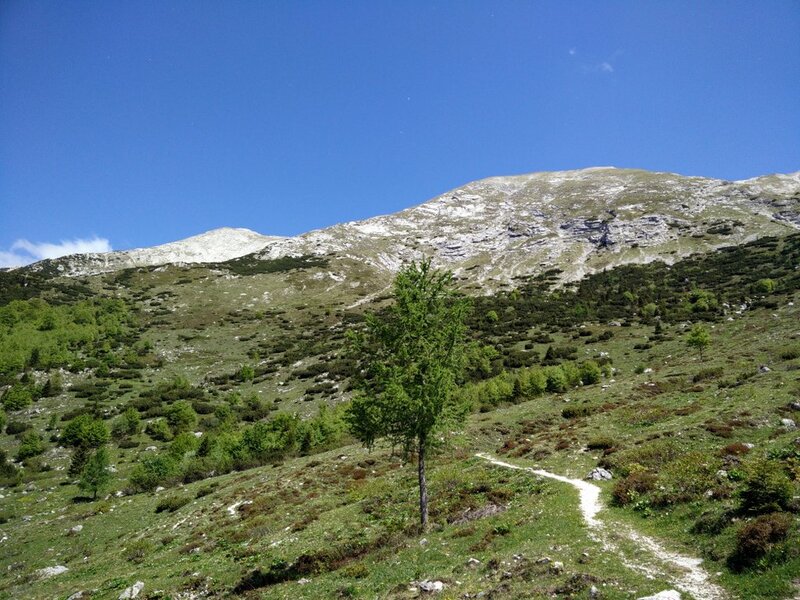 The Vrh nad Skrbino trail is not technically challenging but it does require some physical preparedness as it over the distance of almost 13 kilometers ascends/descends for around 900 meters. 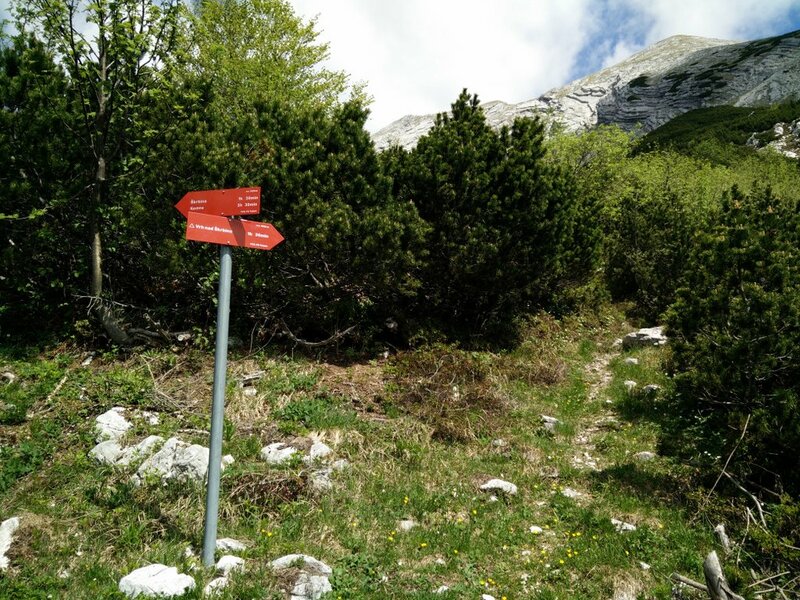 If you are looking for a little easier hike check out the Vogel hike (which I did in 2016) – it starts at the same place as Vrh nad Skrbino hike. 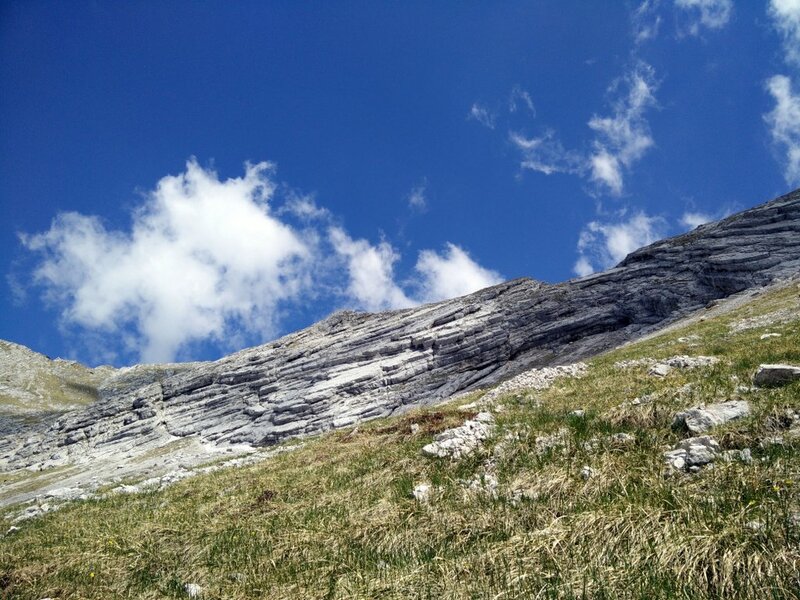 Planina Kuk is located close to the towns Bovec, Tolmin and Kobarid. These three towns are very popular among tourists because they offer great possibilities for outdoor sports such as mountain biking, rafting, tubing, canyoning, paragliding, and of course also hiking. 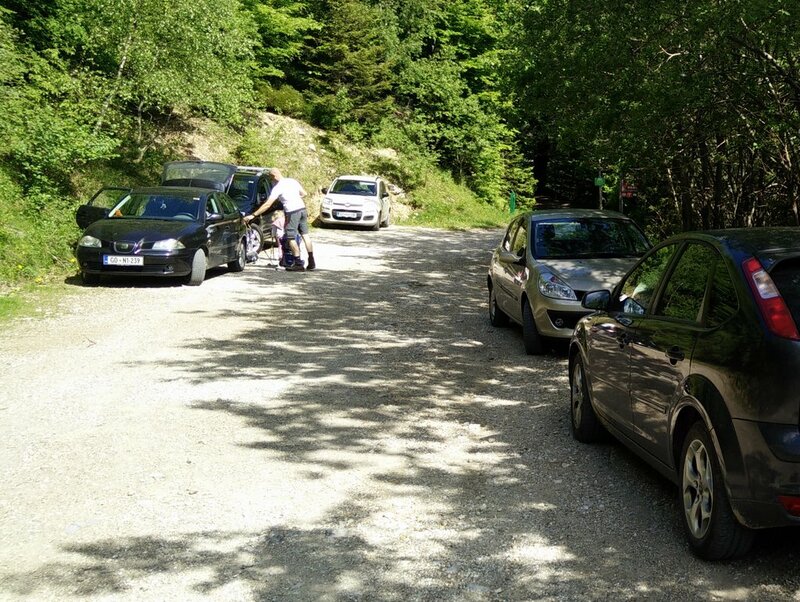 To reach Planina Kuk you will need a car as there are no public transport routes in this area. If you are coming from the north (western Austria or northeastern Italy) you should drive along the Austrian A2 expressway or the Italian A23 highway towards Tarvisio. Take the Tarvisio exit and continue on the local road towards Tolmin. On the way you will go through the towns Cave del Predil, Bovec and Kobarid. Then drive through Tolmin and at the end of the town (there is a directions sign) turn left towards Poljubinj and Ljubinj. 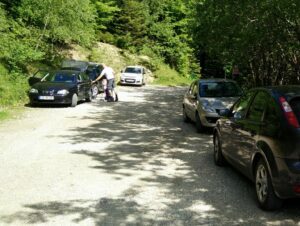 In Ljubinj turn left towards Planina Kuk and after driving for several minutes on a narrow and steep road (which eventually turns into a wide dirt track) you will reach a parking place where you can park your car free of charge. The road also ends here. If you have a GPS device, the coordinates 46.212921, 13.785179 will lead you directly to the parking place. If you are arriving from the east (Italy) you should first drive to Udine and then continue towards Tolmin through towns Cividale del Friuli, Pulfero and Kobarid. From Tolmin continue as described above. 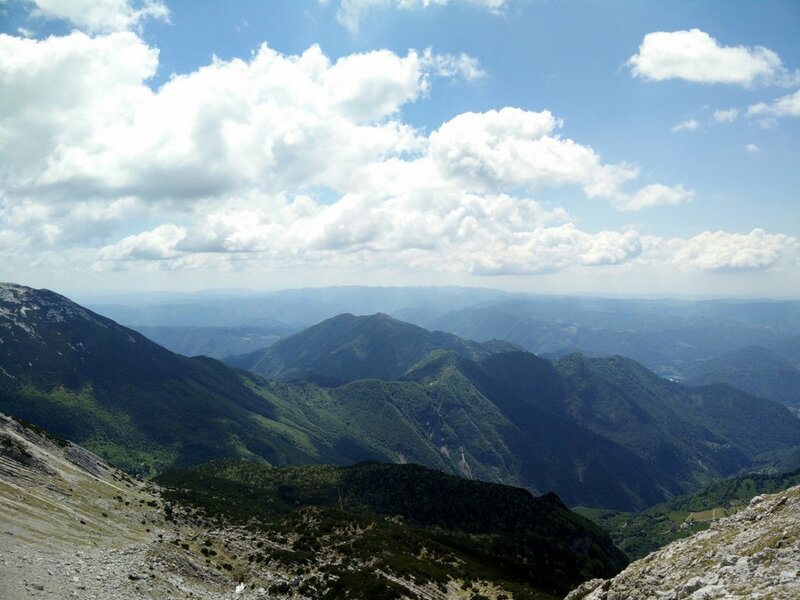 You can also reach Planina Kuk from the east. Drive along the Slovenian E61 highway until you reach the Logatec exit. Take the Logatec exit and continue on the local road to Tolmin (approximately 75 kilometers). In Tolmin turn right towards Ljubinj and continue as described above. Navigating the trail is not very difficult as it is well-marked with direction signs and painted red and white circles on trees, rocks etc. From the parking place start walking on the wide dirt track towards north and after a couple hundred meters you will arrive to a big farm. Continue past the farm and soon the track will start ascending gently. Stay on this wide dirt track for 3.4 kilometers until you reach a directions sign. 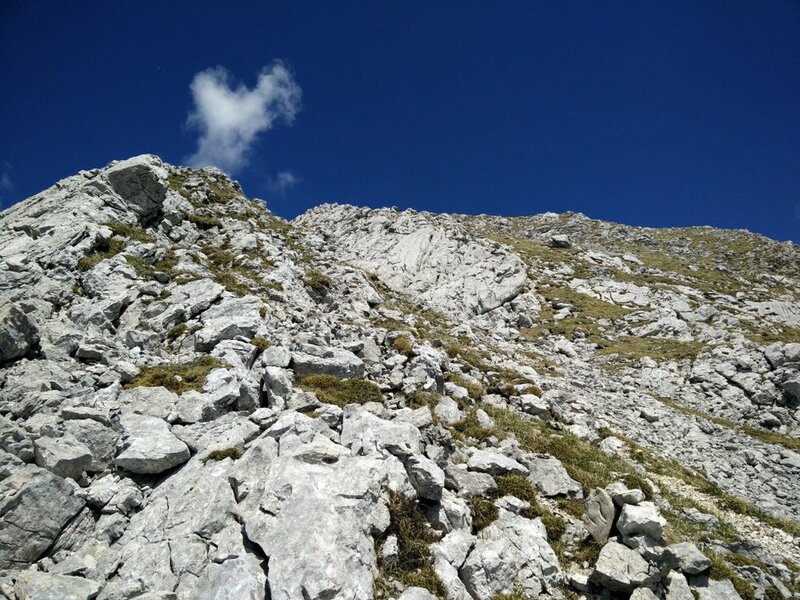 Here you should go right on a narrow path in the direction of Koca na Planini Razor (mountain hut). 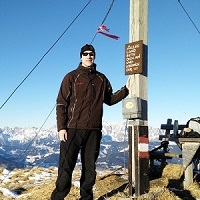 After walking for a few hundred meters you will reach the mountain hut which offers drinks, cooked meals and accommodation. Here you can also refill your water bottles or hydration bladder for free as the tap water is drinkable. From the mountain hut continue on a narrow path towards north and after hiking for several hundred meters you will arrive to a crossroad. There is a direction sign at the crossroad and you should go straight ahead in the direction of Vrh nad Skrbino (to the right is Vogel). The path ascends rapidly towards the southern slopes of the ridge beneath the peak. Then the path changes its direction towards west and remains flat for 500 meters or so. After that you will arrive to another crossroad where you should go right in the direction of Vrh nad Skrbino (to the left Skrbina). The path starts ascending rapidly in the direction of north-west towards the peak. From here on you have approximately 1.3 kilometers of hiking left to the top (elevation gain of 500 meters). On the top you will be rewarded with a great view on the surrounding peaks and the valleys beneath. 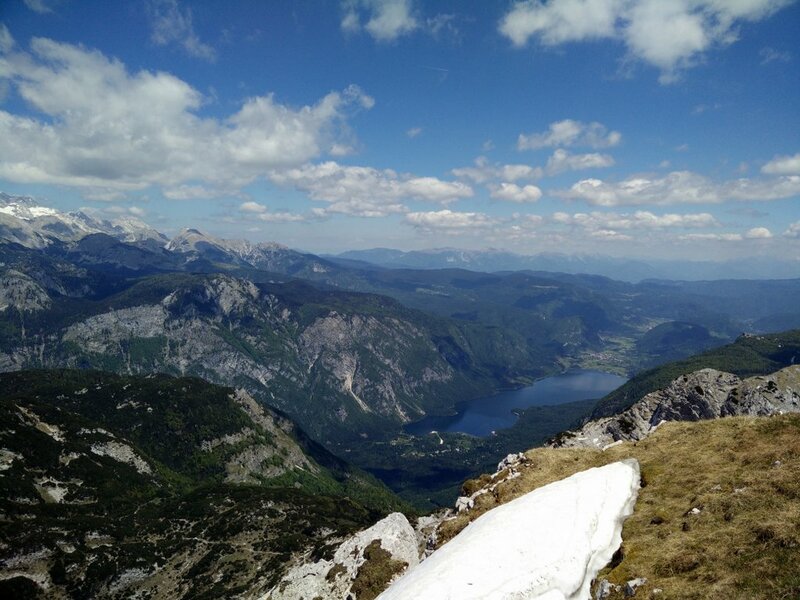 You will also clearly see the Bohinj lake which is located north of the peak and very popular among tourists for swimming and hanging out. 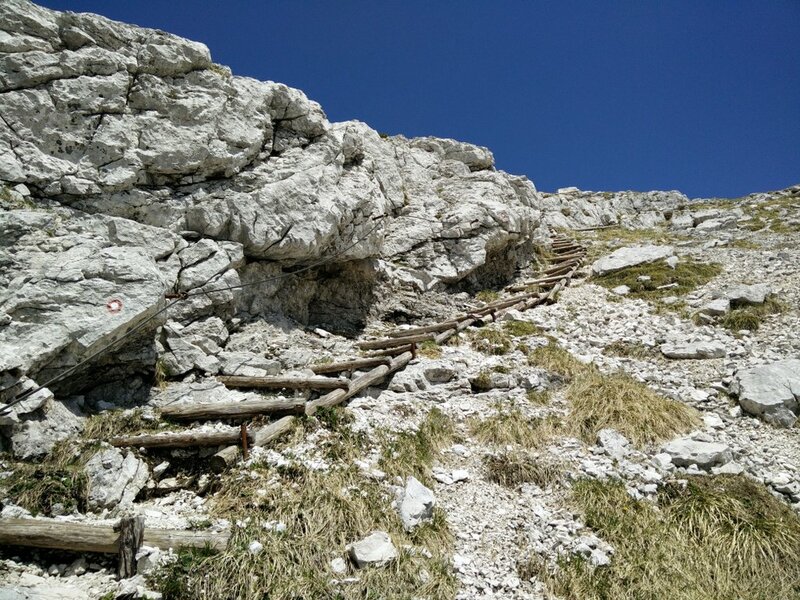 As the temperatures were very high in the afternoon, I used the same path down as for the climb. As it was very warm and the hike wasn’t very demanding, I didn’t bring that many things with me. 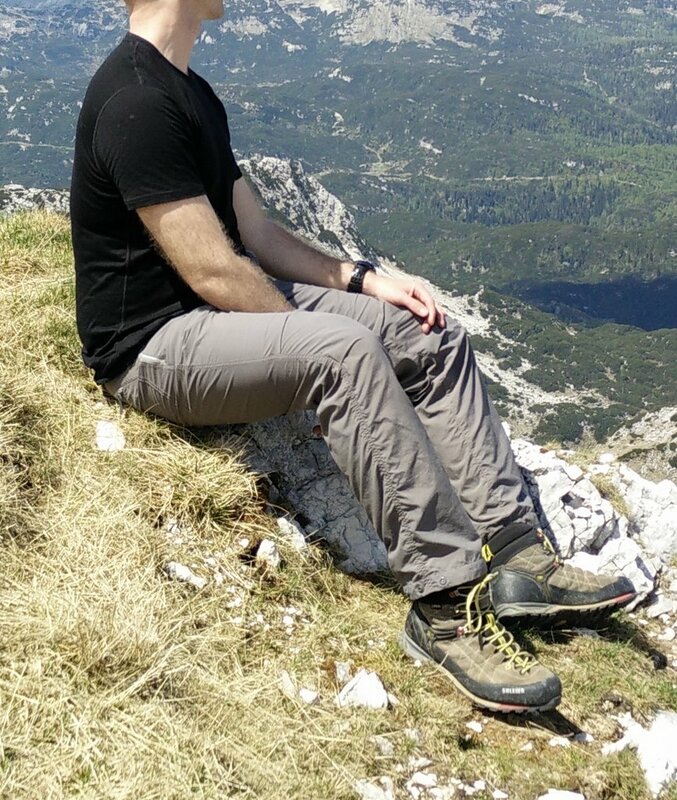 During the hike I was wearing the Wooly Merino t-shirt, Montane Terra Pack pants, Salewa Mountain Trainer Mid hiking boots, Woolx Merino Boxers, a baseball cap and socks made of Coolmax fibers. In my Osprey Talon 22 backpack I was carrying the Montane Minimus rain jacket, food, 3 liters of water and some accessories. 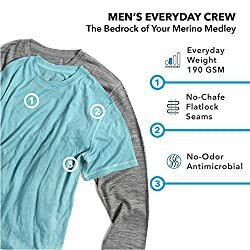 I was wearing the Wooly Merino T-shirt as a base layer and I was very satisfied with its performance in warm weather. The t-shirt is made of very thin Merino wool fabric (150g/m2) and thus it offers great breathability and dries very fast. The material is also very pleasant to the touch and doesn’t cause any itching. After the hike I couldn’t detect any signs of unpleasant odor – Merino wool in naturally antimicrobial. 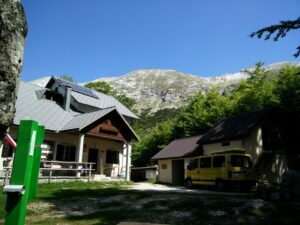 The Vrh nad Skrbino hike is not very demanding and therefore it is suitable for basically everybody who is reasonably physically prepared – even for families with kids. However, keep in mind that in winter, late autumn and early spring the trail might be covered with snow and thus require winter equipment (crampons, ice axes, gaiters etc.). In summer it can get very warm in this area and therefore you should bring sufficient amount of water (3 liters or more), sun cream, sunglasses and headwear. 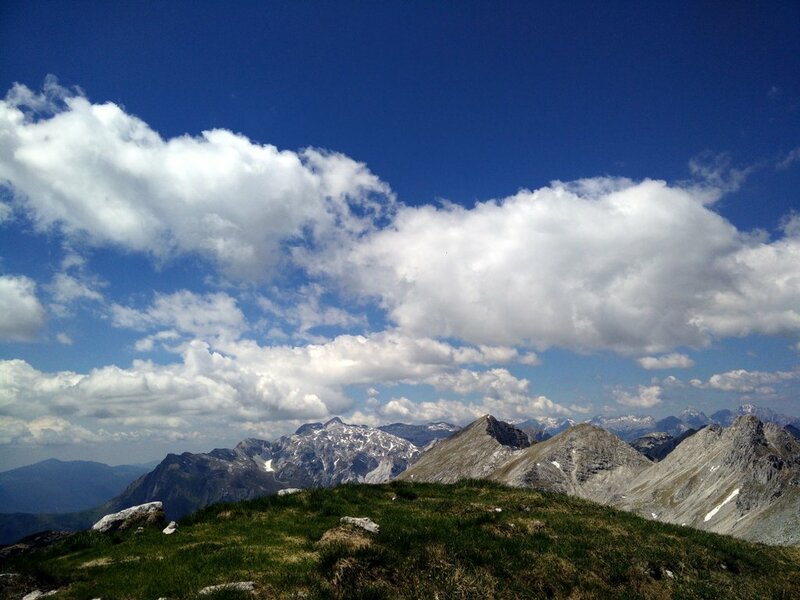 Check the weather forecast before going – in case of bad weather with a risk of thunderstorms I recommend postponing the hike. Hiking Footwear Guide – How to choose the right footwear?